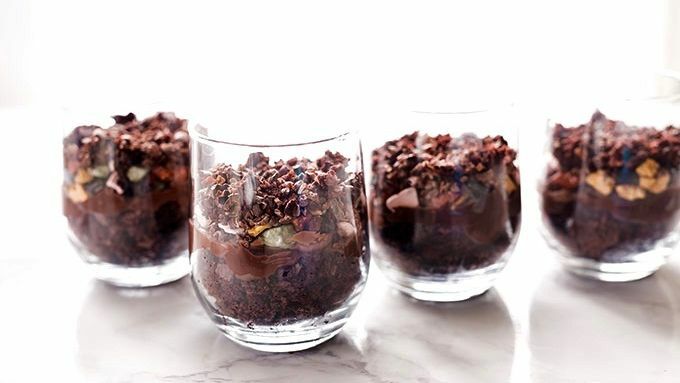 Crumble brownies to make “dirt” and fill the bottom 1/3 of four stemless wine glasses with brownie crumbles. Top with a layer of pudding. Add a layer of chocolate candy rocks, followed by layer of cacao nibs. Arrange candy rocks and chocolate mushrooms on top. Place taffy succulents in the center of each terrarium. Snip sour straws into 3/4-inch pieces, press into a cluster and arrange on top along with the succulents. Refrigerate until ready to serve. 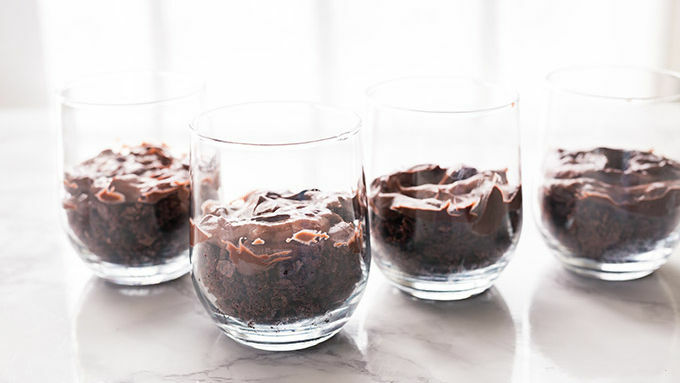 Our blogger used Meiji™ Chocorooms, which are available for purchase online here. 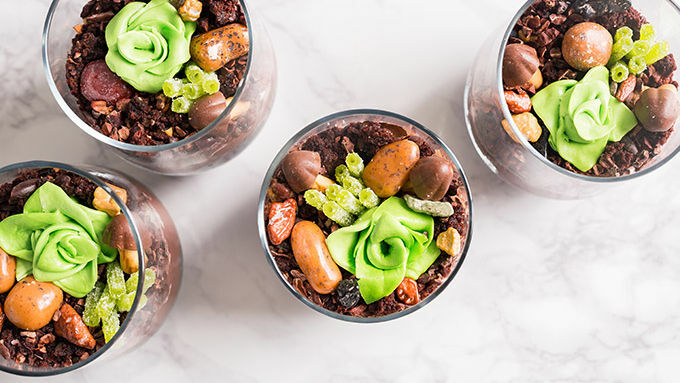 We’ve turned the classic “dirt cake” into a beautiful succulent-topped edible terrarium. To make this recipe perfectly the first time, a few things you need to know: • Though this recipe looks fancy, it’s surprisingly simple to make. Gather all ingredients and prep each before assembling for best results. • It was important to us that these adorable terrariums be simple to recreate at home. Most of the items can be picked up from your local grocery store. Some items may need to be purchased from a party store, a bulk candy store or online. 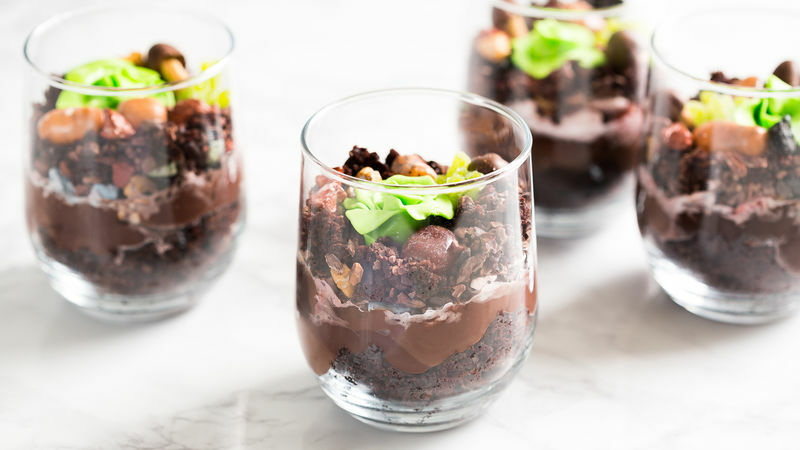 • To makes these terrarium cakes even easier to assemble, you can prep many of the ingredients a day ahead of time. That gives you plenty of time to bake and cool the brownies, and snip and shape the succulents. • We tried several methods for making the succulents, and here’s the simplest way we found to create those cute little plants: take two small pieces of Laffy Taffy™. Set them next to each other lengthwise, to create a long piece of taffy, between two pieces of parchment. Microwave for 5-6 seconds to soften the taffy, then use a rolling pin to quickly roll the taffy into a long, thin piece. Allow to sit and cool for 60-90 seconds. Then use a sharp pair of scissors to cut down the center of the taffy (cutting right through the parchment, don’t remove that paper quite yet!) in a zigzag pattern. Gently pull the parchment from the taffy, and roll each piece into spirals. 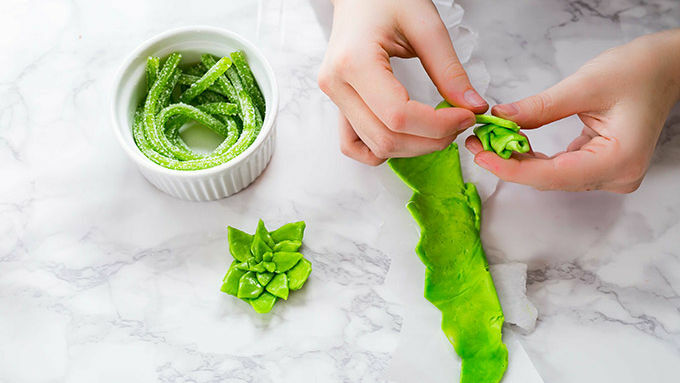 Mold the zigzags on each piece with your fingers to create the succulent “leaves.” • Alternately, microwaved pieces of Laffy Taffy™ can be individually molded into succulents, as desired. Once prepared, keep these desserts in the fridge until ready to serve. We recommend making them 1-2 hours before a party, but not more than 24 hours before, as the coating on the candy rocks can soften and “melt” into the other layers.